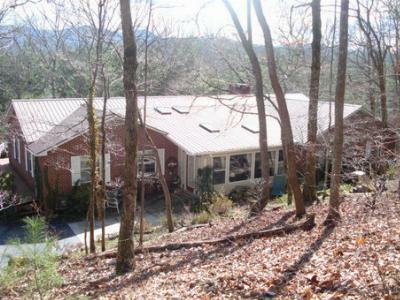 Quality and Workmanship abounds in this Beautiful Mountain Home. 2600 SF of living area all on one Level, 2 Car Garage and a huge unfinished lower level. This includes an In Law Suite with Bedroom, Full Bath and Kitchen, Sitting Room and access to the Utility Room. Hardwood Floors, Skylights, Sun Room, Granite Fireplace, Beadboard Ceilings, Ceramic Tile and lots of natural light. The owner is a master Wood Worker so the home has many unique shelves and touches you won't normally see. Located just 6 miles south of Franklin, NC, only one hour from Cherokee, NC and Harrah's Casino and 70 minutes from Asheville, NC. South Macon Elementary, Mountain View 5-6, Macon Middle and Franklin High School are all within a 15 minute drive.